A lip stick and lip liner duo ... lip, lip, horray! This lightweight balm provides you with colour that changes based on the temperature and pH of your own lips to give you the customized shade you've been searching for. (Matricaria) Flower Extract, Fucus Vesiculosus Extract. May Contain (+/-): Red 6 Lake (CI 15850), Yellow 5 Lake (CI 19140), Red 21 Lake (CI 45380), D&C Orange 5 (CI 45370), Blue 1 Lake (CI 42090), Titanium Dioxide (CI 77891), Yellow Iron Oxide (CI 77492). Ingredients: C12-15 Alkyl Ethylhexanoate, Ceresin, Caprylic/Capric Triglyceride, Polyglyceryl-2 Triisostearate, VP/Hexadecene Copolymer, Euphorbia Cerifera (Candelilla) Wax (Candelilla Cera), Polyethylene, Ozokerite, Microcrystalline Wax (Cera Microcristallina), Beta-glucan, Triolein, Lecithin, Phytosteryl Canola Glycerides, Linoleic Acid, Palmitic Acid, Oleic Acid, Stearic Acid, Tocopherol, Sorbitan Sesquioleate, Zinc Stearate, Methicone, Caprylyl Glycol, Phenoxyethanol, Ascorbyl Palmitate, Hexylene Glycol. May Contain: Titanium Dioxide (CI 77891), Mica (CI 77019), Iron Oxides (CI 77491, 77499), Yellow 5 Lake (CI 19140), Blue 1 Lake (CI 42090), Red 7 Lake (CI 15850). I have been using the studio spice liner for many years. Its the only liner I use. Whenever it comes in stock I buy multiples. The liner has not been available for a good long time.I bought this combo solely for the liner. The lip shine was a welcome surprise. Gives a pretty hint of color and is very mouisterizing.Ill order this duo again if it stays in stock. I wanted to buy the YBF lip liner and the only one in stock came with this Lip Mirage. 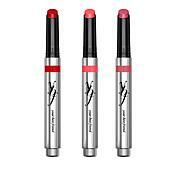 It works well to moisten the lips before applying lipstick, letting the lipstick glide on easily. This lip liner is the perfect shade and keeps my lipstick or the lipgloss it comes with from running into any lines I may have on or above my lips. The lipgloss is a perfect shade and complements the liner. I would recommend this and buy it again. the lip color is so creamy. And go on nicely. but my daughter loved what it did for her lips. I had purchased the four different sets, kept two, sent the two back. I have the balms to my daughter and kept the lip-liners for myself.